SOUTH BEND, Ind. 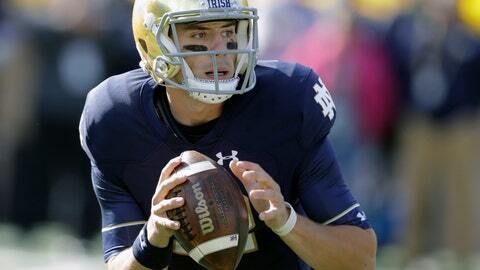 (AP) — Ian Book came into spring practice with the idea of being out of his comfort zone. At a school that has produced its share of legendary quarterbacks, the 6-foot, 208-pound senior was told by coach Brian Kelly and offensive coordinator Chip Long to push the envelope. The season-ending, 30-3 loss to Clemson fuels Book’s hunger to be even better. A late-season rib injury that forced him to miss the Florida State game was followed by a three-game span (victories over Syracuse and Southern California before the playoff loss) during which Book’s completion rate fell to 56.4%. He was just 17 of 30 for 160 yards against the Tigers, whose nasty defense forced him to scramble over and over again. The message this spring: Get rid of the happy feet, stay in the pocket, go through the reads and take a chance on the throws he dared not to attempt in 2018. Including the deep ones. Book took up Long’s gauntlet, on the field and in the locker room. Kelly and Long said they like what they’ve seen in more than a dozen practices ahead of Saturday’s 90th Blue-Gold game. Book’s teammates have seen the positive changes, too. On Tuesday, Book was as accurate as ever with all of his throws, the best a back-shoulder, 40-yard effort to Claypool, a 6-foot-4, 229-pound senior. Kelly and Long have been able to turn their attention to 6-foot-5, 225-pound Phil Jurkovec, who saw mop-up action in two games his freshman season but has a clear role as the likely backup this year with Brandon Wimbush’s departure to Central Florida as a graduate transfer. Quarterback Brendon Clark, a 6-foot-2, 217-pound true freshman, arrives on campus in June. Kelly said he sees Jurkovec mastering those little things. So is Book, who has lofty goals. “You watch any guy in the NFL, it’s pretty amazing they are able to stay relaxed in the pocket, go through all their reads and make the right throws,” Book said.